Whew! The last day of the blogathon! 31 days of nonstop blogging – come what may! And I have surprised myself that I completed it despite having a lot of reservations in the beginning. But like last time, I’m dissatisfied with the worthiness of the posts. Ofcourse, its my online diary and sure it will serve me years down the line when I come back here and read the 2014 travelogues and Chutku tales which have given me maximum fodder for posts. But, I question the usefulness of these posts for anyone else coming here. These posts are useless in terms of being helpful to anyone. I wish I wrote something more socially productive and something that someone will bookmark to come here later. This blogathon, has therefore, opened my eyes to the fact that I’ve been so steeple(d) in my own cocoon world that I hardly observe much beyond it. Which is sad actually. I need to look around and get involved in a lot of other activities than just work,cook,eat,sleep and take care of Chutku. However, Im not going to stop coming here like how I did last year. I intend to keep this blog as alive as possible and Im sure I will have a lot of fodder at least for some time while I shut shop here and move countries. The best part of this is the friends – so please don’t stop coming by here to check on me and my life 🙂 Do stay tuned! – He loves to be out of the house-ALWAYS! He is most happy when we are out of the house and keeps asking “Where next”. As long as the next is not home he is happy,else he can start a tantrum anywhere and for the smallest thing. -He has this Stories for 5 year Olds book that I’ve been reading for him for nearly 6+ months now and he has his favourites. He always asks for the same Danny and Sam story who go camping in their backyard and the Meg and Mimi story of getting lost in the forest – Im so bored reading the same ones over and over but he refuses to listen to any other. Even if its any other-there HAS to be 1 of these stories along with it. Another is a book about a little lion Cub that keeps getting into trouble while the daddy lion is sleeping-his super favourite – I guess he relates to all the naughty things that the cub does-he keeps giggling at the antics. will not go to USA atall! Now, that was not done, we had to reverse the damage – so I told him about snow and playing in snow – his idea of snow – that Cadbury Ad where the couple throw snowballs at each other, roll on the snow-like that! He says him and I should make snowballs and throw them on Appa and then run away and hide :-D. That was a close call! would push out his arms like Spidey and I had to run away from him 😀 But, one time,just one time, we let him watch Spiderman on TV, guess what-he got scared of the black spiderman and woke up with nightmares 3 times that night 😦 Who knew? -Another one of his favourite movies is Dhoom 3. He loves the bikes and the bike scenes. 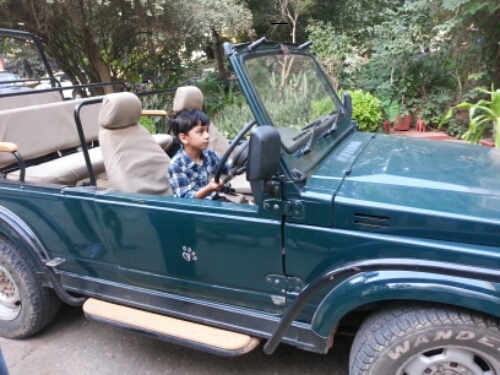 When we went to Bandipur, and were waiting for the safari, he spoke to a forest officer and asked him who he was. The forest officer (inspector?) was good enough to respond to all this fellow’s questions and asked him what he wants to be when he grows up. This fellow first says Police and then immediately changes it saying “No nooo, I want to be the Dhoom 3 kaLLa(thief)!! Because he has the super bike and I want to ride a super bike! !” Thankfully I was not there and hubby didnt know where to look so he just got him back to the car. The cousins who were with us were ROTFL! Ammaa,amma,ammmmaaaaa,ammma,ammmmm everything. He wakes up when Im having bath or in the bathroom at 5 in the morning and starts calling for me loud enoigh to wake up the neighbouring households 😦 Sometimes when Im right there and he hasnt seen me, to hide his smile he tells me “I only called to say I love you” 😛 Cheeky fellow. Chutku, here are a few of my thoughts that I want you to know, that as your mother, these are a few things that I would want you to learn. lego home and dont care about how it reaches there-thats your imagination and I never want that curbed. Education is important, but let that not hamper your growth. You need the education that school gives you to grow up and be able to compete with any crowd. Play – Play hard and play by the rules-It will teach you discipline. Learn every game possible. Its ok if you are not the best or if you loose. It will teach you that you cant win everytime, it will teach you how to handle the loss. It will also teach you to appreciate a fine game when you see one and help you learn better-if you want to.Whatever you play-play because you enjoy it, play because it makes you smile and laugh-play because it will get you involved in a group. Money-Ofcourse, now you are beginning to understand that everything needs money. Yes-it does. So, earn your own money-through the right means, by your own hardwork-nothing gives you more satisfaction of getting that salary at the end of the month when you feel you deserve it! And nothing gives you more satisfaction than buying something essential with that money too. But-understand that money comes and money goes-dont hanker for it- as long as you have enough to get you all that you NEED, its enough. It need not get you all that you WANT – save for your wants and then spend it when you have saved enough.In the meantime if there is a NEED – spend it and start saving for that WANT again-no big deal…It will make you evaluate and respect that Want and keep you grounded. Friendship – Make friends, loads of them. As your mother though, I hope they are good company – so judge wisely whom you want to make friends with. Like the saying goes “Tell me who your friends are, and I will tell you who you are”. Be that 2am friend to somebody. Thats what friends are for. Let go of small arguements when you value that friendship. But dont let them walk over you either-let go, if you have to. Its ok not to be in touch everyday, but have friends that you can call at anytime and start from where you last left-off – thats friendship. Make those 2am friends for yourself-but think twice before you call them at that time-call them when its most important to you,so they know it must be important to you to be calling them at that time – dont take them for granted. Fights and arguments – are a part of every relationship. No two people can have the same thoughts and ideas. No two people can think the same thing always. So its ok to fight and argue. But try to never start a fight if you can avoid it. Think if its your fault and apologise if required. An apology can instantly resolve a lot of differences. But dont say sorry if you dont mean it. And stand up for yourself in any argument when you know you are right. Love and Marriage -Love like crazy, like its blind, like there cannot be another. Express it-if you dont say it-they wont know it.Dont just say-act on it too-Actions speak a lot more than words. Not just when you are wooing, through out your life.Express it in different ways-in ways that matter. Give your trust and respect. Like friends, never take your partner for granted. But, expect the same. Its a relationship of 50-50 partnership. Dont depend on anyone for your own happiness-have your own space too. Dont give so much that you cant take it back if things go wrong. And IF they go wrong, dont hesitate to end it either. Job – Remember I told you, you need money? So you need a job.Its a long long way to go, but still, we cant take care of you all your life. You need to make a living on your own. Do something,anything as long as its not negative and antisocial! Work for your living. Enjoy what you do and take pride in it. Pride in a job well done, pride when you get rewarded too. But dont let that get to your Ego that it stops you from growing and makes you an obnoxious person for others to work with – always be humble and learn from the others-there will be something thats better in someone else. As simple as a shortcut in an excel sheet or as complex as time-management. demands it. Dont be forced to read any scriptures or perform any rites if you dont think it matters to you-all those rites and scriptures are for keeping the mind at peace-they will not serve the purpose if it agitates you further! I know that most of these has a ‘but’ part too…There is just no one way for things Baby. When I think of what I should tell you-I question myself if I believe in it or not, if I think it is right or not-these are just the surface of such thoughts – answers to very basic questions-they cannot explain everything or give you 100% answers sweetheart. Infact, You teach me something new everyday Chinna-keep doing it! Its now been a month since the hubby has left for the far shores and I have been quite comfortably managing myself and Chutku. The stress of his travels and work was pretty high and I have to admit there were a lot of arguements in the process. The Rajasthan trip was a good break with company that ensured that we didnt have the time for any arguments! The day I took Chutku alone to the indoor play gym near the house-Wish here were here. We couldve comfortably let the little fellow play and we could’ve had a cup of good coffee in peace like the other couples here – I had told him, when he was here about it, but sadly we never got that chance..
Chutku’s birthday, well, nothing more to say there…Who else could be more important? The day I went to the supermarket and was looking for the right veggies-when he would say”You pick up the greens and I will choose the tomatoes and onions” knowing I dont like doing that choosing. “Do you want …. or should we pick up that particular juice?” “you never buy that pumpkin or sweet potato” . “Lets try this for Chutku”…”Lets start green tea from tomorrow”…I missed all these…. Someone to take Chutku to midnight bathroom breaks, or silently giggle at his midnight speeches. The 2hr bus journey home, wish we could go home together! Thanks to blogging and book reviews, I got inspired by the reviews written by TGND and Maya and read a few books from their recomendations. With too many things happening, couldnt actually read a lot though this year. Books by Michelle Moran – Started with Nefertiti that TGND had highly reco’ed and then couldnt resist buying Cleapatra’s daughter and the Heretic Queen. Totally loved these books – transported me to a different Era. The view points in Nefertiti, the politics, how young girls think of powerplay – I was astonished and shocked! Really? A 13 year old can plan and plot so much?! Loved the love story of the sister and then partial continuation of the clan in Heretic Queen. Cleopatra’s Daughter comes as a much later date but that again was kind of an eye opener about the Roman empire. For someone like me who likes history but cant read it because its very dry and boring – these books like those of the Taj Series were a good insight into history wanting me to read more. The Krishna Coriolis Series by Ashok Banker – This is a series of only Krishna stories that as the author himself mentions, has been gathered from around the country-most stories that we know and some that are very local and interesting to read. Ofcourse, the series hasnt ended yet and after finishing reading the 7th book, Im now waiting for the next part of it. Not the best series like the Mahabharatha but still good timepass reads. That reminds me – anyone reading his MBA series? I wonder when the next book will be out. Ramesh Menon’s Ramayana – I had read Ramesh Menon’s Mahabharatha and loved it, and since Maya keeps talking about Ramayana – I picked that up too. I liked the story telling but didnt convince me of Rama as God again – sorry Maya! But what I did like about the storyline was that it never wanted to preach about Rama being God-which is acceptable to me and so finished the whole series though it took me nearly a month of night reading to do so. I also caught up on some of my regular Nora Roberts and JD Robb fixed along with reading some of the other books by Indian authors that I’ve forgotten-so totally not worth mentioning here. Currently, started reading Living with the Himalayan Masters by Swami Rama- like it but its not giving me that urge to read and finish. Maybe I need to mentally re-adjust and tell myself that it IS a book to slow read and assimilate. 2013 saw us do a Kerala trip for a whole week of all offbeat places. But it didnt cover the places that was in my bucket list since the husband had already seen it – mainly Kanyakumari. VISA formalities were through, he suddenly said – “Plan your Kanyakumari trip for your Bday – who knows when I might have to travel after that and we might not be able to do it for a couple more years.” Thats it! That was enough for me to plan. Hubby, being him, loves to drive and insisted that we drive the 12hrs through Madurai to Kanyakumari. So that was the plan – Start early, drive to Madurai – reach Madurai by afternoon and then drive to Poovar island for 2 nights there. Then drive back to Kanyakumari, spend a night there and then back to Bengaluru. I did all the bookings accordingly. we start a day sooner and drive all the way through Kerala – totally avoiding Tamil Nadu. halt. We stayed at a hotel where the Kerala football association players were staying-Sachin Tendulkar’s team which thrilled hubby 🙂 The nice play area was a disaster since it was raining continuously through out the evening. We promised Chutku that he can play the next morning as according to Ms. GPS the journey was a lot shorter. The next morning post breakfast, we let Chutku play in the play area for sometime and then started towards Thiruvananthapuram. It was a 6hrs drive and the idea was to reach there by 4pm, visit the temple and drive to Poovar by 6-6:30pm since the distance was only 35kms. Whew! Though we were told that the Kerala roads arent that wide and there would be a lot of lorry traffic – we really didnt imagine it to be that bad – it was like driving within the city limits through out and the hubby didnt enjoy the drive a single bit. Narrow 2 lane, 2- way traffic highways with really bad driving- worse we got stuck in Cochin traffic for nearly an hour. By the time we reached Thiruvananthapuram it was 4:45 which was still ok-but we hadnt stopped for lunch anywhere. So we took a quick pitstop at a coffee day and then drove to the temple. and wear them on our clothes-hubby and chutku being bare chested inside the temple :-). though there wasnt really any crowd. Within 1/2 hour we were done and we started from there by 6pm still thinking we could reach Poovar island by 7pm. actually set foot on the resort, it was 8:45pm. It had been a horribly long day and we were just ready to crash. A quick dinner later we were taken to our floating cottage where all we did was hit the bed! Coca Cola 🙂 Post lunch we all relaxed for a while and then went to see the evening program and Karoke with dinner. Chutku found his morning friend and decided to dance to Kolaveri and other such jhatak numbers while we sat and watched and made friends with the girl’s parents 😛 We decided to call it an early day since we wanted to go to the beach again in the morning the next day and then drive to Kanyakumari by lunch time. We had now realised how bad the traffic can be. The next morning we went to the beach again where the hubby and Chutku went to see the fishermen in action and while we were playing in the water a snake went between my legs which totally put me off the beach after that. Got back to the resort and a quick breakfast later we checked out by 10:00 and drove to Kanyakumari by noon. It being Dussera period,there was a procession for the Goddess that we missed but we checked in after seeing Gandhi Samadhi,in time for lunch. Unfortunately, Vivekananda Rock memorial was closed for the procession that day so we couldnt take the ferry to the place though our hotel room had an uninterupted view of the place and the sea and we had an eye-full 🙂 We went to the Kanyakumari temple and to the edge of the waters where I took a deep breath and saw those vast waters and felt patriotic! A pleasant evening later, we sat at the restaurant looking at the lights on the rock memorial and had dinner. Again, since we wanted to wake up early the next morning to see the sunrise, we slept early. The alarm rang at 5am the next day, I woke up, looked out and realised that it was still totally dark. Quickly had bath and came out and sat at the window overlooking the sea. Meanwhile hubby too woke up and got ready. We saw traces of the sunrise in the sky – the orange and pink hues and a little light but never actually got to see the sun ‘rise’ from the sea 😦 before we knew it, the sky had turned blue and the sun was up… However, I felt that joy in seeing a sunrise over the seas of Kanyakumari-the one it is so famous for. Quickly got Chutku ready while the restaurant sent us some packed breakfast that we had requested and we were on the road towards Madurai by 6:30am. Thankfully by this time we heard that all was quiet and peaceful in Madurai. While hubby drove, I ate and fed Chutku his breakfast of sandwiches and fruit and then for the first time, I took the steering while hubby could relax and have his breakfast – felt good to give the poor guy a break from the driving 🙂 We reached Madurai by 10:30 am and rushed to the temple. OMG! The temple complex is HUGE! If you dont know from where you entered you could get lost! We memorised our gate of entry and then spent the next 2hrs within the temple. Despite taking the 100rs coupons there were queues everywhere and we even didnt know which direction we should be going. We first stood in the wrong queue to see the God when the priest told us that we needed to see the Goddess first! Quickly we went in search of the Goddess and after her Darshanam we came back to see the God. The famous Madurai Meenakshi, decked in all finery because it was the last day of dussera. She looked beautiful and radiant and as luck would have it, we had to sit down and wait for the curtains to open while they decorated her and then until the Aarti was done – so it was a real blessing 🙂 that too, it being my birthday as per our hindu calendar. We were out by 12:30pm – out in the sweltering hot sun that we were parched by the time we got to the car. The car and the water bottles were all heated up as well, it was THAT hot. We then put the GPS and went in search of a good hotel for lunch. Found a very good one (I forget the name now) and had yummy buffet lunch sitting in an AC room, which was a pleasure in itself! We started from Madurai at around 2:30pm and like always did a nonstop back to Bengaluru. Home in time for dinner by 8pm. seeing a tiger and we had been seeing a lot of Tiger photos that friends had clicked and uploaded on FB – so it was decided we would go to Kabini. By the time the decision was taken, it was quite late and the jungle lodges was almost booked. While searching for other options which would have variety to keep the little fellow also occupied and happy I stumbled on Red Earth and a couple more places. I promptly sent the links to the husband and within the next hour he calls and says “I’ve booked Red Earth”. one to the water, plenty of deer but not the elusive tiger. We were told that since it had been raining, the tigers had plenty of water inside the jungle for them to come out to the man made water holes. The 2 hour drive just zipped past and we were soon back at the resort. We thought we would take the safari the next morning at 5:30am and asked for an alarm call at 5am. We quickly called it a day after the drive from Bangalore and Chuktu not having slept that afternoon. waters of the kabini dam, went on a bullock cart ride and a coracle ride as the sun set. It was so calm and peaceful and serene. there was a monsoon offer starting while we said that we opted for this particular weekend because it was our anniversary the next day-monday.She asked us if we would like a special dinner but we refused since we had Chutku with us and we really didnt like such things. Ever since it was decided that the hubby will travel before me, I have been thinking that the weekends are finally going to be a relaxed affair and I can do what ever I want and those 2 days are all going to be free. But what do you know! Man Proposes and God Disposes! Every weekend has been a hectic running around. Dec 20th – First it was the Little Monster’s birthday and I was busy that weekend painting his shirt and making arrangements for the cake and other things. Dec 27th -The weekend after that, I had to take the LM for his 5th year booster dose vaccine – one on each leg and the whole weekend went in tending to his fever and hurt leg – poor fellow couldnt walk at all and I had carry him around even for the bathroom…ofcourse he was clingier than ever-not that I blame him poor thing. Jan 3rd – The weekend after that was kind of hurried too. Im trying to sell off stuff and friends have been helping me -by buying from me 🙂 So one of them came to pick up the Washing machine and then on sunday had a lunch party with visiting relatives of the in-laws. Thankfully, Chutku had school on saturday, which gave me the opportunity to run out and get some outside work done while he was at school. Jan 10th – Last weekend was more hectic than all the others! I needed to shift down with my parents so they could start with the house-showing to prospective tenants. 1 me with 2 hands can only carry so much stuff at one time. So, by saturday afternoon despite doing about 20rounds I could hardly setup half the stuff. My friend N came with her 3.5 year old L and we took the kids out to play in the indoor gym close to home. The kids kept us amply occupied until 7pm when my friend left. I love the fact that little L likes our home and likes Chutku’s company – he wanted me and Chutku to go back home with them that night 😀 muaah. Jan 11th – Sunday, all morning I was sorting out stuff that I had to send away to the in-laws place and by the time they came at 12:30, I was still a little more than half way thru 😦 In all this confusion, another cousin called and asked if we should take the kids to a story telling session on MG Road that afternoon from 4:30 to 5:30 by the Bangalore Story telling group – Heads and Tales. Decided to brave the evening and said yes! Chuktu was thrilled to be meeting his fave cousin A and we got picked up and driven around. After the story telling session, the adults needed some coffee and we headed up to Das Prakash right there on MG Road Boulevard. The idea was just coffee for us and something for the kids. But the owner of the restaurant was right there, and he decided to give us everything thats the speciality there – Patrala Dosa, GoLi bajjis, Rave vadas, Irish Stew, Ice creams for the kids, Special samosas – whew! I ate so much that I had to skip dinner after that!! Everything was simply yummyyyy. And to top it off, we werent charged for anything that was offered for taste except the coffees and the cheese and set dosas we ordered! Only thing was we had to listen to the owner uncle talk through 85% of our time there and though I got irritated at first that he was just not letting us be – felt guilty later for thinking such thoughts because they refused to accept the payment! Well, got back only by 8pm, some more sorting stuff around and Ive finally moved in with my parents. Chutku searched for friends his age, where ever we went – he went and said hello to a few kids too. In Jaipur, during lunch time we saw another couple with a 5year old girl having lunch. That kid was also so full of enthu, that she kept calling him and they kpt running around the tables and pillars of that small place – and we somehow fed him bits and pieces of lunch. He was once more thrilled to see the same girl at Amer Fort – his excitement was acenuated when she also walked up to him and called him! The same thing happened during the 1 day we spent at Poovar island too – he made friends with another girl his age, played with her and happily even danced with her that evening during the music show 🙂 That girl apparently even asked the next day where Chutku was, as she wanted to tell him bye before they left 😀 I wonder why there were no boys for him to make friends with…hmmmmmm…..hmmmmm??? There was a little older couple who were staying at the same place we were staying. This LM walks up to the lady at the breakfast table and says “Aunty, Is this your pappa you have come with?” Thankfully, the question was asked in kannada and the couple didnt know kannada, so our face was saved! :-O Hubby immediately said, take him from here, I will finish breakfast and come. I immediately took him out…whew! But to his credit, I need to admit that the lady was thin and didnt look her age while the man was dressed more traditionally and had a thinning hairline and a potbelly 😦 . We have done 4 safaris last year – 1 in Kabini, 1 in Bandipur and 2 in Ranthambore and our LM was thoroughly bored of them all – 1 look at the tiger and he was like “Lets gooo, we saw the tiger, why we should be here for so long”. Since the Kanyakumari trip was a lot of travel and it was just the 3 of us, I had told him to sleep during the journeys so that he wouldnt get bored – so we both slept in the back seat watching the blue sky and the white clouds passing by 🙂 We also managed to watch a lot of stars in the desert camp at Jaisalmer – makes me a happy momma, though Im not sure that these things didnt even register in that little head. While little S slept through most car journeys, our little monster refused to sleep. I would keep him occupied with some activity book, or he had his cars or his favourite was playing Car and Airplane with his S doddamma in the last seat. Poor S doddamma hardly had any choice but to play with him everytime little S slept. Only day he was quiet was the travel from Udaipur to Sawai Madhopur since he was running a temperature and had both stomach and head ache. Poor fellow-we all actually felt very sad seeing him so quiet! Just a couple of tantrums were also thrown in for good measure. There was that 1 auto ride in Udaipur late in the evening after the Palace sound and light show, where Chutku was sitting facing the back in the auto when we got lost. Post that trip, everytime we started and we started talking about routes, he asks if we are going on the right route 🙂 Even reminding us at times to check where we were going 🙂 He seems to be more stickler for perfection than me! There was a time, about a couple or so years ago, when I didnt think about going online for shopping. Shopping for me was about touching and feeling and trying it on before buying. But over a period of time, I saw that a lot of family and friends were vouching for online shopping – everything from clothes to cosmetics to home furnishings to jewellery and electronics! That was when I decided that I didnt want to be left behind and I have to understand how the whole thing works. The hubby started with ordering some pen drives on Amazon while I started with guess what – Books 🙂 Obviously – couldnt go wrong there now, could I? Flipkart became a regular. Then one time, mom wanted a pair of comfortable closed sandals and we bought a pair for 1799/- in Shoppers Stop. The next weekend when I was checking Myntra, I saw the same pair for 799!! I cool, 1000rs lesser! Same brand, same color and I decided to pick it up for myself. When it arrived, I checked the quality of them both – the touch and feel and found no difference. I was totally hooked – I have now stopped shopping for footwear in stores! Even if I like a pair, I check the brand, come home and pick it up online 🙂 The next graduation was clothes – picked some simple T-shirts for Chuktu and liked the softness of them. Then on a shopping spree, picked up 5 Tshirts for the hubby at nearly half the price we would’ve paid if we had bought those brands at any of these shopping malls. But I was still apprehensive about returning. Thankfully, a pair of sandals ended up being tight that forced me to return – now, that gave me confidence of getting my money back and returning without hassles. The best part of the whole thing is that I can do this shopping late into the night-when Chuktu is asleep, even after a long day at work. Especially if I need to pick up something as a gift for someone and I just dont have the time to go and pick that perfect something! I love the fact that I can buy them all anything of my choice that I feel would be personal without ending up giving a gift voucher. I have the time and liberty to browse through loads of stuff and order them without having to stress about the time. Mostly the things also get delivered within a week. If there is some problem-all I need to do is call up their 24/7 and they will promptly respond with a refund or give me a solution that would be good.